"The civilized cause more trouble than the non-civilized. The civilized try to destroy the barbarians. It's not the barbarians who try to destroy the civilized. The civilized defined the barbarians. The 'others' are the barbarians. 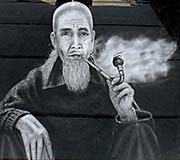 in Muang Sing who told me that he has been today in a village where the natives have never seen a white man before. He believed he was the first who went there. A historical, 19th century kind adventure of 'exploring' imagined unknown, white spots on the map. Organized, guided and under protection of the tourist industries. In the era of miniaturized computer devices and GPS. 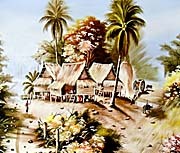 In these villages there might be a dancing or cooking performance given, colourful costumes shown and some pieces of local art sold. Sometimes young Westerners are encouraged to help working on the fields or in the village for one or a few days. There might be even a resort in which the visitors stay for a night. After having their photos and their dishes, they go away and didn't get much of a background look of the hill peoples life. However, what's actually going on here? 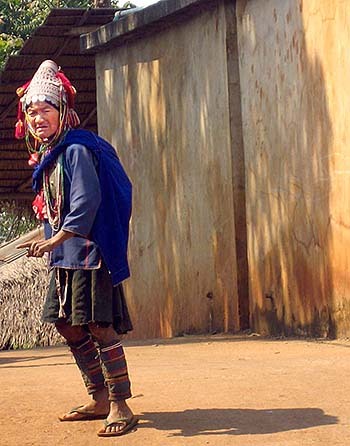 There are hundreds of different hill tribes around in a huge, mountainous area from wich the Greater Golden Triangle might be merely the best known part. If civilized people see these hill people, they appear sometimes very much as back in time, undeveloped, poor, uneducated, ill-equipped, uncultivated, as real hilly-billies. They often don't have even an organized religion, practising Animism. 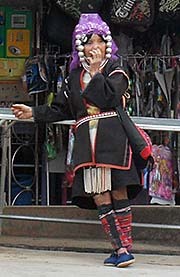 If Asians from the cities visit the mountains, they may have a view on the mountain people as to visit their own ancestors. It looks pretty much that development went on in the plains, valleys and coastal regions, but it didn't in the mountains. It seems, that the hill people live like in an isolated state of stone-age and that they ever did so. This first glance is treacherous. There was always exchange between the hill people and the civilized people in the plains. They traded together goods and there was always an exchange of people itself. People from the valley states joined the hill people communities and vice versa - for some reasons hill people came to the plains and lived in a valley state. To get a better understanding for the hill people, it's necessary to have a look back to history. Southeast Asia is far not as long inhabited as Europe is. Homo sapiens arrived much later here. In a way history seems to be 'delayed' here somehow. When the first Europeans arrived (the Portuguese, in 1509 CE), mainland Southeast Asia was still in a condition comparable to the old Greek world. There weren't modern territorial nation states, but city states with local influence around. Let's take the examples of city states like Sukhothai, Ayutthaya, Lopburi, Lanna (Chiang Mai), Luang Prabang and, not to forget, mighty Angkor (the medieval Khmer empire, which times were over already in the early 16th century) who were small, middle-sized or large kingdoms. They formed a network of trade, expanded their borders only in the way to subdue other cities and make them vasalls or close allies. 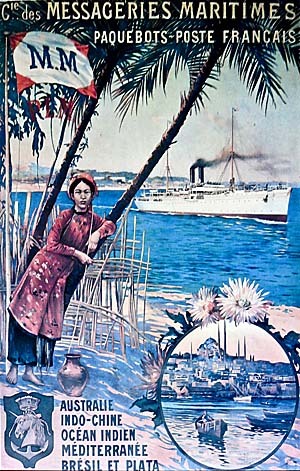 Ayutthaya was situated on an important, ancient trade route between India and China and became the most important, rich and powerful city state in Indochina. 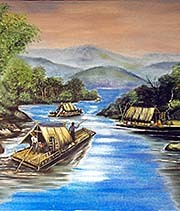 Those cities were placed near rivers in the plains. Their influence was strong in the nearer surroundings, but fainted away by growing distance. Wet rice cultivation was crucial for their maintenance. In the hills and mountains they lacked control. But these city states were small and the stateless land around them was huge. There was much space to escape slavery around the Asian despoties. People could hide in the forests, in the mountains. The majority of the population anyway lived most of the historical times as stateless people outside of declared borders in remote areas. When states expanded into their territory, most of the local population always retreated to non-state areas. Step by step deeper into the hills and mountains. Tough life there, though, but possible. 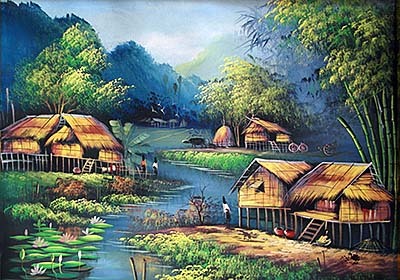 The jungle is almost impassable, but one can follow waterways upwards, finding and cultivating patches of land as gardens, living from fishing, hunting and all the many fruits growing here. Living in small communities, away, self-governed and independent from the stratified class societies in the city states. So, one can imagine, the possibility to escape had consequences for the states. As more they oppressed their peasants, as more of them disappeared into the forests (or joining other states). That meaned a drain of valuable working power and recruits for the army. It was crucial for the city states to control as much of the country as possible. 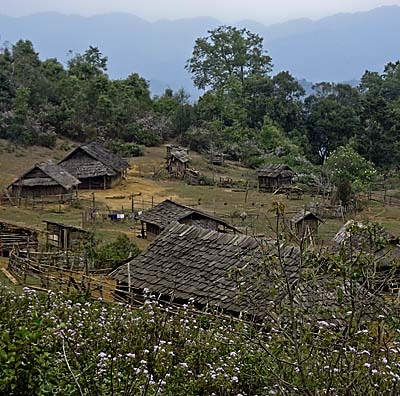 Considered that sedentary communities first appeared in Southeast Asia about 3,000 years ago (see 'Ban Chiang Archaeological Site') and were small spots in huge, slightly settled or completely unsettled land masses, it's a long way to control most of the land. That wasn't given until the second half of the 19th century, when colonialism spread out around and, in the same time, Bangkok Siam expanded to the south, east and north, colonialising all the people and tribes so far they could not escape. In fact, this process is still ongoing, yet many tribal people are living in remote areas in patterns of an 'old', premodern live style. Not only to speak about Thailand, but the same happens in almost the whole of Laos, northeast Cambodia and the Cardamom Mountains (see 'The Areng Valley'), big parts of south China (namely Yunnan), the biggest parts of Burma, north- and central Vietnam and it stretches even out into the Himalaya and into Indian territories. This huge mountainous area, in which many lowland people, who escaped the nation-building process of the emerging states in the plains found refuge over generations, is called 'Zomia'. This name for the region was given by Willem van Schendel, a Dutch anthropologist, one of the first who realized the meaning of this big, remote, widely state-free region. Although everywhere the postcolonial territorial nation states try to control all the people on their territories, they partially failed to do that thoroughly here until today. A sketch of the geographical expansion of Zomia. The reasons for this failure are generally that mountainous, forested areas are difficult to control. And here we have a really huge mountainous area, in fact the largest on earth. It's the Himalaya and all it's offshoots and foothills. These areas are slightly settled, covered by jungles and rainforests and the populations split up in a huge number of different ethnics, languages, cultures and tribes. To control these people is a big effort for the lowland states as the civilizing centers, penetrating the periphery. It costs so much resources that it is not always worth the effort. The ancient city states could only dream of it, they simply lacked the recources by far. That changed when it came to the (industrial) exploitation of sources like timber and minerals in the second half of the 19th and more in the 20th century. With the development and application of modern technology, the nature did more and more retreat and terraforming creates completely new, urbanized, industrialized landscapes who deprive hill people from living their traditional lives. With the emerging territorial and nation states in the 19th and particularly in the 20th century and the development of modern economies, 'progress' was brought into the hills and mountains of Zomia. Growing state populations in the plains, advancing technologies and the hunger for sources for the industries and the world market made the colonialization of the remote areas attractive and profitable. Also, the hill people were now supposed to make a contribution to the national income, getting developed, educated, integrated in schools, business and other social institutions and, above all, being taxed. This is, not to forget, a still ongoing process. And it's not always as peaceful as it might sound here. In Laos I have been told by people who lead UN development programmes that in certain cases Chinese investors in Laos demand from the Laotion government to 'clear' areas from the local, tribal hill people who live there before they build up large plantations of rubber trees and other cash crops. That means in practice, that the government sends troops (certain, kind of 'hunting' units) into the villages, driving the people out of their houses, burn the whole village down and forbid the people to ever come back. The same happens in Cambodia, where estimated 500,000 people are landless due to land grabbing practices of international corporations in cooperation with the government, respectively the army. That's one aspect of developing a country. The agrarian industries generate tax income for the state and some jobs in the plantations and in the transport sector. Local shops and the construction industries gain income and profits by a growing amount of circulating money. That principle of development is the same for all the countries around here, might they have been governed by colonial regimes, by feudal aristocracies, by communists, ruled as authoritarian military states or semi-democratic. That's just different appearances of the same principle of modernization, promoting economic and social progress. Social inclusion as standardizing people by education in language, knowledge and business follows. 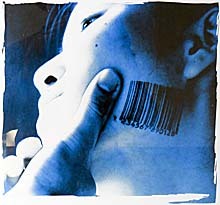 Being the subject of a state always meant to be controlled, taxed, drafted for warfare and being enslaved or oppressed. For the longest time in history there was an alternative for the people. They could try to escape, leaving the small, state controlled areas and living in the forests, the deserts, the swamps, the mountains or wherever the state didn't have control. The stories of these people are not told in official historiography. If, then they mostly appear as outlaws, criminals, bandits, pirates etc. Official history tells us the story of the kings, the states and historical events like wars, battles, the erection of remarkable buildings or infrastructure and so on, always from the perspective of the ruling classes of the civilized parts of the world. 'Good', capable kings and states survive, others fail and fall into oblivion. History is written by the winners. The fact of slavery as the basic of civilization is seldom mentioned, maybe with the exception of black slavery in the 19th century USA. But that's widely considered an 'exception', for it was a racial enslavement of an alien people from another continent and not an enslavement of the so called 'own' people. Besides, it was abolished as the result of a allegedly 'justice' war3. In fact slavery was crucial for any state in history. Their success always based on the exploitation of labour. There was always an internal colonialisation coming before an external, subduing the 'own' population first. What the state considered 'barbarian'4 territory, was also a source of human material. Frequently expeditions were sent to captivate 'savage' people for enslavement. When states, who were always very much war machines, led war against other states, the winner brought home slaves from the defeated side for it's own prosperity. That was generally so; a perfect example of it is the history of the expansion of the Siamese state in the 19th century5. 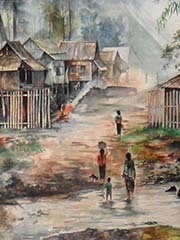 The social problems in Thailand's Isan region for example date back to Siams colonial expansion when captivated Khmer and Laotions were settled down there as slaves and peasants. Numerous other examples are given by the expanding colonial powers in whole Southeast Asia (and worldwide), who made the populations their servants and slaves for their exploiting industries. After gaining independence from the colonial powers, the new founded states continued a similar way of modernisation. Over the time countless people fled the rule of the states into the wilderness, forming their own communities or, in many cases, joining existing communities. Many others lived since all times so, strifing nomadic around, avoiding being captivated by a state. 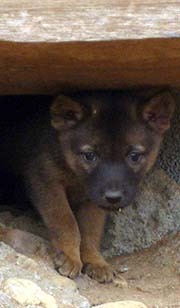 They are self-organized, egalitarian, often non-literal but have an oral history. And there was always contact between the 'civilized' and the 'barbarians'. The hill people were always trading with those of the lowlands. They had access to resources the people in the plains could not easily gain. Deer, ivory, jewelry, gold, certain forest goods like fruits, roots, animals and so on. Strange thought for us modern people nowadays, but for the very most time of history the vast majority of the world population was stateless. That changed within the 19th century, when sedentary people within state borders became the majority. Still, a huge part of the world's territory was stateless. But with the expansion of Western colonialism over the whole globe things started to change rapidly. They changed dramatically with the more and more ongoing technical progress, opening sophisticated possibilities to control first stateless land and then more and more anything what's going on on the surface of the earth. that there is not much space left anymore for people trying to escape captivity by a nation state. On the heels of this notion of sovereignty came the realization that these neglected and seemingly useless territories to which stateless peoples had been relegated were suddenly of great value to the economies of mature capitalism. They contained valuable resources - oil, iron ore, copper, lead, timber, uranium, bauxite, the rare metals essential to the aerospace and electronics industries, hydroelectric sites, bioprospecting and conservation areas - that might in many cases be the linchpin of state revenue. Places that long ago might have been desirable for their deposits of silver, gold, and gems, not to mention slaves, became the object of a new gold rush. All the more reason to project state power to the nethermost reaches of these ungoverned regions and bring their inhabitants under firm control. Development and modernization are modern principles meaning to subdue anything under the economy, exploiting anything to make profit with. Social change is triggered by technological advances. Though, technology again is always serving economic purposes. Advanced technology plays also the key role in the further fate of Zomia. The surrounding states are, with the exception of Burma, mostly stable. They have a rapid economic development at the time. 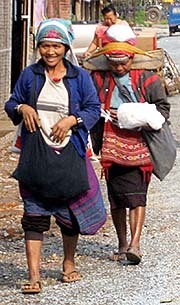 In Laos there still happened insurgery until 2002. 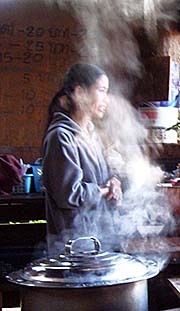 There it was still in the aftermath of the Vietnam War that Hmong people fought the central government in Vientiane. Particularly the mountainous north was not under control of the government. The route between Vientiane and Vang Vieng was save, but from there up into the mountains to Luang Prabang and further, the road wasn't save. Buses and other vehicles were frequently raided. When I was in Laos in former years there was always at least one uniformed man at the rear bench, armed with a machine gun to guard the bus. That's now history. 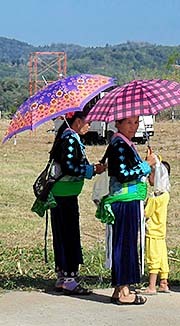 Now it's mostly save in Laos, insurgery ceased and the Hmong made an agreement with the government. The country is under control. The mountains are free now for the advance of modernization. In Thailand was a lot of fighting in the 1960s and 1970s, particularly in the north. 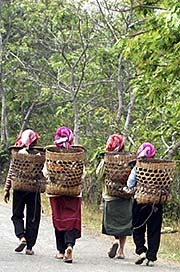 Parallel to the Vietnam War communist groups fought against the Thai government, retreating deep into the forests. 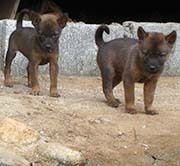 They fought very successful against the Thai army who couldn't gain control over them. 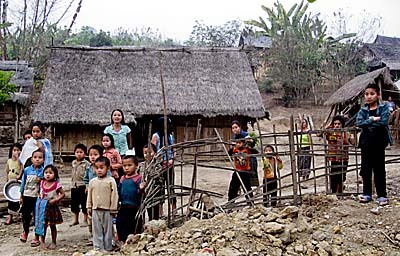 The army used agent orange to clear the forests and bombed hill peoples villages out8. American style - they were allied and supplied by the US army. Since then it was programme to clear the forests by burning and logging. In 1960 some 80% of Thailand were covered by forest. Nowadays it's just 30% anymore, and these forests are by a good deal smaller patches, if not plantations. That makes the area very well controllable. 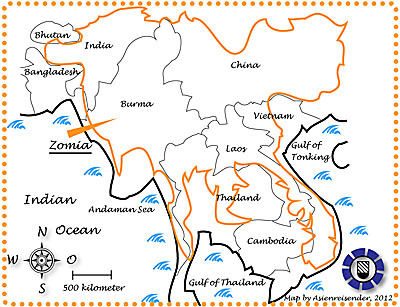 Thailand is probably the most advanced country which shares parts of Zomia. Everywhere in the north, particularly near the borders, are military and police posts on the roads to control the traffic. The hill people in Thailand have a tough existence here. Many of them lack Thai nationality though they live here since long. According to the law only people who live in Thailand since three generations are granted to get Thai nationality with all the rights: working permit, free mobility, passport and the right to vote. Though, many of the hill people can not prove how long they already stay in Thailand, so they fail to apply for Thai nationality. They live in remote areas still in the mountains in assigned spots, and they are pretty much handicapped by the law. In many cases they are not even allowed to leave the district they are living in. Burma suffers deeply under a military dictatorship since 1962. There was huge insurgency in most parts of the country. 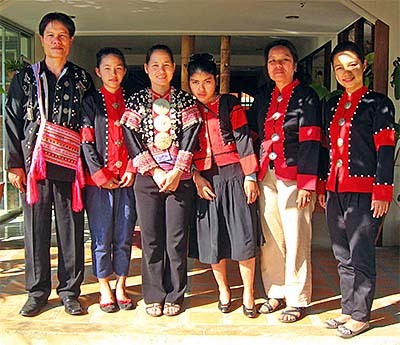 More than 50 ethnic groups fought the government. Many of them lost over the decades. Nowadays there are still 22 ethnics at war against the junta. Since Burma's territory is mostly mountainous, the government has big problems to gain control over the country. Therefore they get support from China. Since a few months there is some change in Burma. There were the first elections since 1962 who weren't completely faked. It seems, that the junta tries to arrange a controlled change of the ruling system. We will see, how it's going on. However Burma's future will look, any government will try to gain control over the whole country, to develop it and to domesticate the people in the mountains. China is by far the biggest country which streches out into Zomia. China is stable, strong and a fast growing, big economy. Of course the government makes big efforts to control the mountains and it's people. One milestone on this way is the construction of a big, new transport road between Yunnan via Laos to Thailand. Since it looks pretty much that tribalism and being stateless has of course no future, will be extinct soon like the cultures of the American Indians, because big business and powerfull states with their laws, police, prisons, armies and particularly their computerized superior new surveillance technologies are always successfull in the long run - doubt remains. Looking around nowadays it's obviously that the big protagonists of modernization are in trouble. The USA are in big trouble, the European Union is in trouble. But, also the booming and emerging economies of China and Southeast Asia, India and Brasil are in trouble. Not to speak of millions and billions of normal people or middle-class companies, also including the big companies, the banks, the global players, who are fighting every day for success are very vulnerable. So, actually everybody is in trouble. If everybody is in trouble, the system is in trouble itself. Meanwhile even the short-term future is unpredictable. There is a global crisis of the ruling socialeconomic system. Still widely ignored by 'normal', civilized people, it's a structural, long-term crisis of capitalism. In my view, capitalism has reached the end of it's historical development as a system. Let's call the phase it's in now late capitalism. Let's make a prognosis: It won't come over the next decades. In 30 years there will be no capitalism anymore. It's coming to an end. The question is not, what can we do to mend contemporary socialeconomic problems. The question is: What's coming after capitalism? Since all alternative ideas of social organization have been fiercely destroyed by the ruling forces in the 20th century, nobody has nowadays a real alternative to offer, which could replace the capitalistic system. The masses of people are mislead, alienated, uneducated, ignorant, abused, enslaved, lack relevant information... what's to expect next? When the ruling system breakes down, there will be violence. There are masses of weapons in the world - armies, police, security companies, private people are enforced with plenty of powerfull arms. The arms industries are among the most sophisticated and profitable industries in the world. We eat crap, the environment ist destroyed, our thoughts and emotions are poisoned, almost all of the consumer goods are cheap, short living crap - but the guns and weapons available are of the best quality. When this system breakes down, there will be only violence, masses of people will die and suffer. That's the end of civilization, the downfall of modernization. And then I wonder who will be in a better state of survival - the civilized or the last remaining 'barbarians' in the remote mountains in the world? 4) The term 'barbarian' dates back to the Roman Empire. They called all non-Romans Barbarians, for their strange kind of verbal expressians what was understood as "barbarbar" only.